The Geografreak | The adventures of a travel fanatic Janelle Rominski! The adventures of a travel fanatic Janelle Rominski! I’ve been attending the Chicago Travel & Adventure Show for years. While browsing their website for their 2014 show details, I saw they were running a travel photo contest. I entered immediately. Their criteria for the contest was to submit my favorite travel photo from the past year. I went on an extraordinary solo trip to South America and visited Brazil, Argentina and Peru. 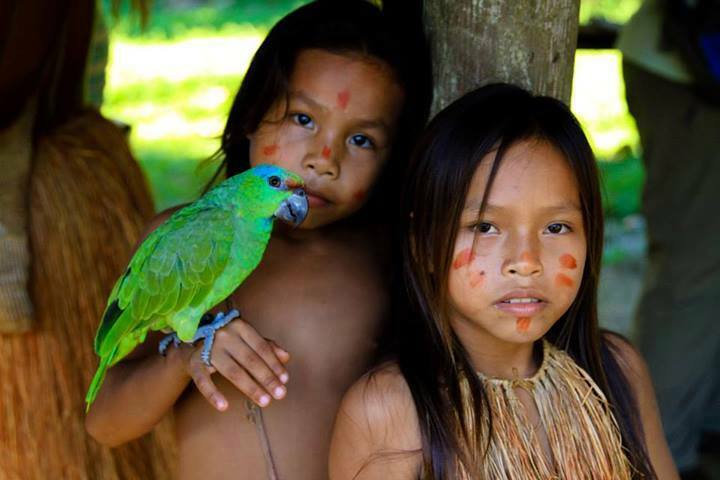 The photo I chose was of two Yagua Indian Children holding a green parrot (above). Out of 165 entries, my photo was a top three finalist, which meant that I got to attend the Travel Show and sit in the front row during Samantha Brown from the Travel Channel’s presentation. After her speech, she displayed the top three photos and chose the Grand Prize Winner in front of hundreds of onlookers. She picked my photo! It was a surreal moment. I’m a huge fan of Samantha Brown and won a trip to Mexico. Thank you to Samantha Brown on Travel Channel, the Travel and Adventure Show, VisitMexico, Aeromexico and Los Cabos Tourism for giving me this opportunity I will cherish forever. Hello! My name is Janelle Rominski and I adore traveling. I love it so much, I call myself “The Geografreak”. Exploring the earth, its features, and people is what I live for. Another passion of mine is photography. I am most proud of my travel photos and enjoy sharing my images of the world to family, friends and fellow travel enthusiasts. Several of my travel photos have been published. I consider myself to be an edgy traveler with sophistication. I have spent weeks in the slums of Africa and Mexico on mission trips. I have also wined and dined on the ocean at the Ritz Carlton Hotel in Maui and various Sandals Resorts all over the Caribbean. On this site, you’ll get to experience my travel adventures through blogging and photos. I will also be posting reviews from hotels and tourist activities. If you wish to have your hotel, resort or activity reviewed, please contact Janelle at JanelleRominski@gmail.com.